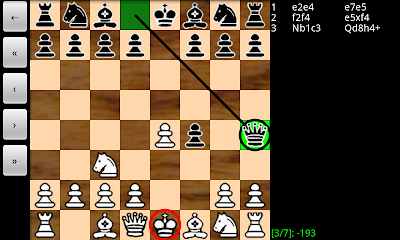 I am extending Chess for Android with a feature to run automatic engine-engine matches between UCI engines that have been "natively" compiled for Android. 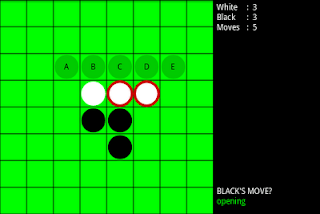 After importing two UCI engines, or using the built-in Java engine for one, a fixed number of games is played using random openings from the built-in book while allocating a fixed time per move. 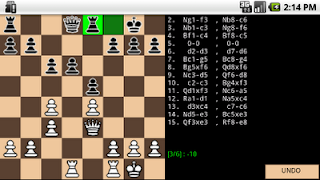 All games are saved in a "match.pgn" file, which can be used by another chess program, such as Arena or Chessbase. 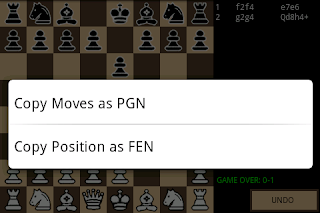 A Chessbase-generated cross-table for a 1-second-per-move tournament between some UCI engines compiled for Android is shown below. I hope to release this feature sometimes early in January. The vacation just started, and Karina and her friend Ella are enjoying 50 lap races on our Carrera racetrack. Nice to see the difference between a year ago, when the girls crashed the cars most of the time, and now, when they actually understand braking before and accelerating in a curve. Still, lots of repairs to be done on the cars when this race is over. I like the Carrera Digital 132 race track. Cars have regular and braking lights, can switch lanes on designated lane change sections, and the speed, braking power, and fuel tank capacity can be set individually for each car. When cars run out of gas, lights are blinking as they slow down, and a visit to the pit stop is required first. Moreover, up to six cars can race together, or autonomous cars can be programmed to make racing harder while an electronic lap counter keeps track of interesting statistics. Added internal iterative deepening to searchConfigurable transposition table and endgame database cacheImproved evaluation functionAvoid querying Fierz's database when *either* side can captureBelow are results of a 3-move openings match between BikMove v1.2 and other engines (1 second-per-move, 256MB hash, 256MB database cache, 2-8 piece endgames, best-move for engines that have their own book). 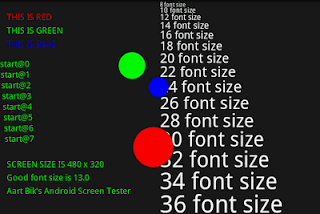 For comparison, also some results under similar conditions with v1.1. 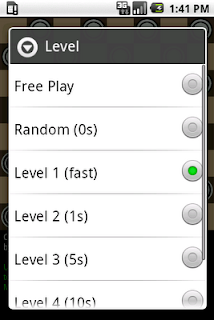 To improve endgame play, I have added a few "distance-to-win" endgame databases to Checkers for Android (K-K, p-K, p-p, KK-K). These databases are small enough to reside in memory and are queried during the engine search. 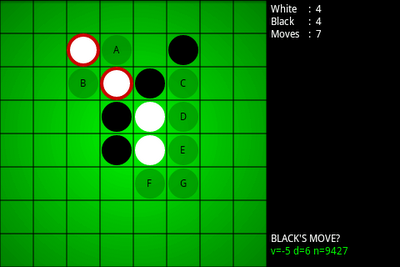 In the screenshot below, for instance, the engine (playing black) announces that it will win in 20 moves. 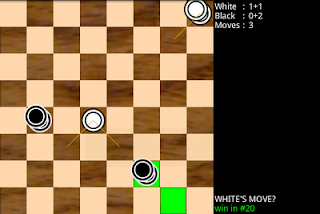 If you are up to the challenge, just download version 2.4 of Checkers for Android from the market. Because it is hard to print all information from the UCI engine on the phone screen, I am toying with a feature where the current move considered by the UCI engine is shown graphically. 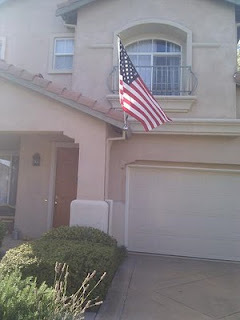 Below is a short demo of this feature. Let me know what you think! 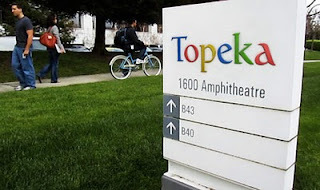 basic UCI engine support (ability to replace built-in Java engine with any third party UCI engine compiled "natively" for Android)Instructions on how to setup an UCI engine are given at UCI for Android. As far as I know currently only BikJump is available as stand-alone UCI engine for Android. Although stronger than the built-in engine, I hope I will be able to add links to much stronger third party UCI engines soon. Please note that support is still rather basic (elaborate setup, only tested on one engine, GUI does not support engine options, time control restricted to time-per-move, position sent as FEN, making the engine more prone to three-fold repetition, no tournaments, etc.). Nevertheless, I hope it is an interesting start. 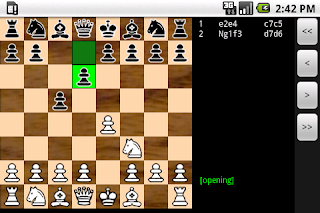 Here is an UCI engine running on a Nexus One in Chess for Android, probing the complete 3- and 4-piece Nalimov endgame tablebases (29.6 MB) from SD card. 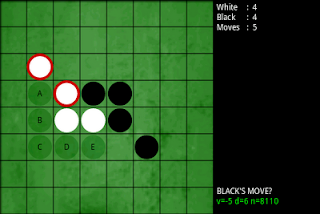 Here is a screenshot where the UCI engine already reports a mate (using the tablebases), while the internal Java engine only reports a negative score for white given a search tree of depth 9. Steps to make this work are shown at UCI for Android. The UCI engine output is now presented in a slightly better format, where information is broken up into individual fields. 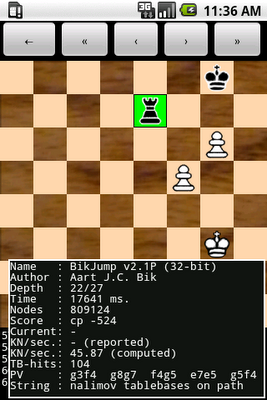 Also, I have compiled BikJump v2.1 natively for Android, which is more elaborate multi-threaded bitboard-based engine that also supports the Nalimov endgame tablebases (with kind permission from Eugene Nalimov and Andrew Kadatch). I copied a few tablebases into the emulator's SD card and started the engine analysis. As can be seen in the screenshot below, the engine together with the probing code run fine on the Android emulator. The UCI (Universal Chess Interface) protocol defines an open interface between a chess engine and a graphical chess program, which allows chess programmers to focus on their engine rather than GUI details. Many programs on Windows, Linux, and MacOS support the UCI protocol (e.g. ChessBase, Arena, Sigma Chess, Lucas Chess), but as far as I know, no UCI support exists for Android. 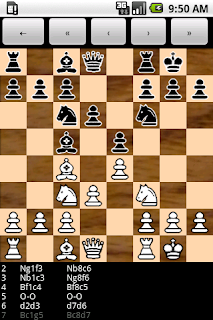 Even Chess for Android uses a simplified Java port of my own UCI engine BikJump rather than going through the UCI interface. 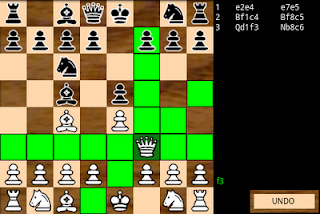 Therefore, I am prototyping UCI support in Chess for Android with the idea that, in the long run, this will allow importing third party engines into the GUI. So far, I added a "kibitzer feature". Any UCI engine binary that has been "natively" compiled for Android (using a compiler that ships with the Android NDK) can be imported through a file finder dialog, as shown below for a natively compiled version of BikJumpv1.8 running on the Android emulator. As long as I am making a trip down to memory lane, I remember how happy I was when I got a Chess Challenger for my birthday in 1981. As a starting young chess player, I certainly learned a lot from playing this computer, and I was thrilled when I had beaten the highest level for the first time. It certainly has sparked my interest in chess programming. 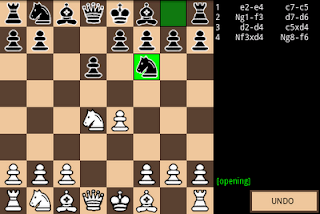 After playing for a while, I discovered that if Chess Challenger responsed to e2-e4 with e7-e7 from its random opening book, it could always be beaten at Level 1 through the game shown below. As depicted on the corresponding photo, the Chess Challenger would admit its defeat by flashing all 64 red indicators. 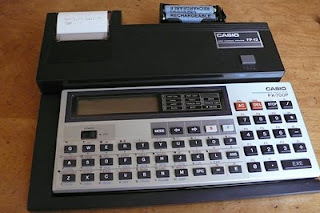 This week I realized that it has been more than 25 years since I learned programming on the Casio FX-700P programmable calculator. This little computer is powered by a 455KHz HD61913 processor and features 2KB RAM, with exactly 1568 bytes available for BASIC programs. Output can be printed with the Casio FP-12 mini thermal printer and programs and data can be saved and loaded using the Casio FA-3 cassette interface. I still use the FX-700P as my desktop calculator, but this week I also tried the printer and cassette interface. The internal battery of the FP-12 was exhausted, so I had to improvise an external battery holder. But after that, the printer still produces those little thermal listings! The FA-3 also still works after all those years, although I could not read my old programs back unfortunately. Time had taken its toll on those old cassettes. 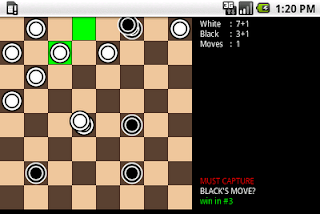 [Event "average 30"] [Date "2010.07.08"] [White "Shredder Java"] [Black "Chess for Android"] [Result "1-0"] 1. e4 e5 2. Nc3 Nf6 3. g3 Be7 4. Nf3 Nc6 5. d4 exd4 6. Nxd4 Nxd4 7. Qxd4 O-O 8. e5 c5 9. Qc4 Ne8 10. Bd3 a5 11. 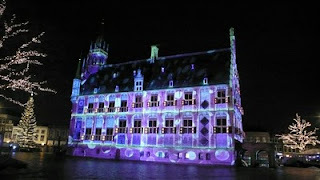 O-O Nc7 12. Be3 Ne6 13. Nd5 f5 14. exf6 gxf6 15. Qg4+ Ng5 16. Rfe1 d6 17. Bxh7+ Kxh7 18. Qh5+ Kg7 19. Bxg5 Rf7 20. Bh6+ Kg8 21. Qg6+ 1-0 White will mate soon. Embarrassing how quickly king safety was lost. Just a few unrelated updates. First, the Android App Review Source website posted a brief online interview with me on developing Android applications. Also, version 2.01 of BikJump ended at second place in the CCC 17th Amateur Series (Division 8), which opens the possibility of promotion to a higher division. Many thanks to Graham Banks for running this tournament! 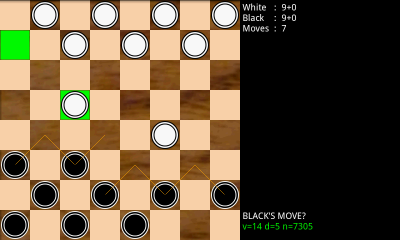 Finally, Martin Fierz published Checkers Tutor for Android, a strong checkers program for Android. 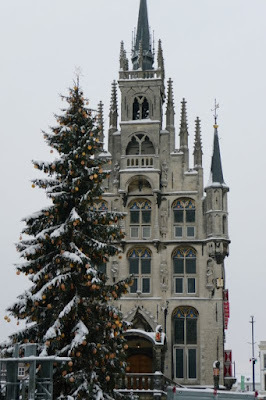 I just came back from a great trip to my home town Gouda in the Netherlands and want to wish all my blog readers a happy 2010.